Mission giver was moved for the Corinth Area remake. This mission is the 3rd mission of the Iron Challenge Longtooth Mission Chain added to the set of Iron Challenge Missions in Planet Calypso Content Release 2010.03. The objective of this mission is to kill 1,000 Longtooth. CFA hosts a series of Iron Challenges. 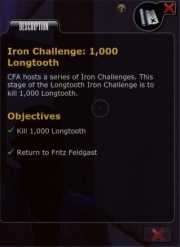 This stage of the Longtooth Iron Challenge is to kill 1,000 Longtooth. Pick up the mission at the broker. Find your way to a Longtooth spawn. Because they are event mobs they will possibly change location. One spawn can be found at (62400,89000) has fewer mobs, but is close to Cape Corinth's Teleport. A second spawn is at (60000,86000) has it's closest Teleport in Skiron. A third spawn is just south of Fort Ithaca at (68500,87300). Mission window showing the objectives. Return to the mission broker Fritz Feldgast located in Cape Corinth. Talk to the mission broker Fritz Feldgast. When you pick your reward you will also be rewarded +1 Stamina. 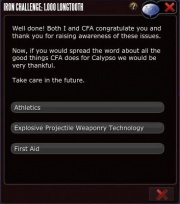 Comparison of the First Aid skill before and after mission completion. This page was last modified on 31 March 2017, at 11:40.